In 2017–2018 German economy remained strong, and access to liquidity continued to be accommodative both for investment and non-investment grade companies in spite of increased uncertainty and volatility in some European markets. One important factor is the availability of cheap funding as a consequence of the asset purchase programme of the European Central Bank (ECB). In October 2017, the ECB's Governing Council had decided that its asset net purchases should be reduced from the monthly volume of €60 billion to a monthly volume of €30 billion from January 2018 until the end of September 2018 or beyond, if necessary, and in any case until the Governing Council sees a sustained adjustment in the path of inflation consistent with its inflation aim. The reduction has not negatively impacted the German credit market for corporates. During its policy meeting in June 2018, ECB's Governing Council reconfirmed it would keep its recalibrated monetary policy unchanged until September 2018, reduce them to €15 billion until December 2018 and end net purchases thereafter. The Governing Council decided that the interest rate on the main refinancing operations and the interest rates on the marginal lending facility and the deposit facility remain unchanged at zero per cent, 0.25 per cent and -0.40 per cent respectively. The Governing Council also expressed its expectation that the key ECB interest rates remain at their present levels at least to the summer of 2019, and thus well past the horizon of the net asset purchases.2 The aim of the ECB's net asset purchases is to encourage the credit market actors to lend to EU corporates and businesses. Hence, the current ECB monetary policy can be expected to contribute to continuous favourable liquidity availability for German companies. On the depositary side, companies – and even wealthy private clients – are increasingly confronted with negative interest rates charged by a growing number of banks. Despite public discussions focusing mainly on consumer protection and PR aspects, negative interest rates have become reality for corporates with surplus liquidity and require particular attention of CFOs in their liquidity planning. 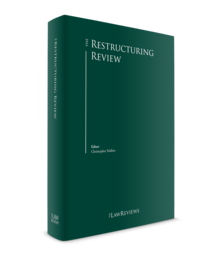 Traditionally, German insolvency law and restructuring practice are focused on formal, court-driven proceedings. However, the focus has shifted more and more from traditional insolvency administration to pre-insolvency restructurings and self-administered processes; management officials tend to seek professional advice at an early stage and systematically explore options to negotiate consensual restructurings, often steered by chief restructuring officers (i.e., experienced restructuring experts). Restructurings of the passive side of the balance sheet are usually initiated by a debtor's proposal for a consensual arrangement (e.g. by seeking to amend bond terms by a majority vote in accordance with the German Bond Act 2009), entertaining debt-to-equity swap concepts or proposing 'amend and extend' solutions; in case these negotiations fail debtors prepare 'Plan B' scenarios as a backup (i.e., will have developed strategies for a formal insolvency which often include the initiation of 'self-administration' proceedings with the debtor pushing for a restructuring as a going concern via insolvency plan (see Section II.ii at Insolvency plan proceedings for details). operational restructurings can be particularly onerous outside of formal insolvency proceedings as German insolvency law recognises a set of (e.g., labour- and contract-related) instruments that are not available in a pre-insolvency stage. once the debtor – or a creditor – has filed for the opening of insolvency proceedings, the preliminary stage (often three months, see Section II.ii at Preliminary insolvency proceedings) of the proceeding is crucial for stakeholders, irrespective of whether the designated outcome of the insolvency is an asset sale to an investor, an insolvency plan restructuring, or a liquidation of the insolvency estate; deals are often fully negotiated at the preliminary stage and potential investors are generally well advised to approach the self-administrating management or the insolvency administrator as soon as possible. Against this background, the potential impact of the European Commission's proposal for a directive on preventive restructuring frameworks, second chance and measures to increase the efficiency of restructuring, insolvency and discharge procedures (COM (2016) 723, published 22 November 2016) is critically discussed among German insolvency and restructuring experts. Practitioners and experts in the competent Federal Ministry of Justice currently explore how the proposed instruments and procedures could be reconciled with domestic insolvency law, to what extent Germany should support the Commission's plans and how the German legislator should sensibly use the discretion Members States may ultimately have under an EU framework law. Expectation is that implementation of the Commission's proposal would have a considerable impact on German restructuring practice and also require substantial domestic insolvency reforms (e.g., in relation to the German concepts of 'imminent illiquidity' and 'over-indebtedness' which are recognised reasons for a debtor to file for insolvency, creditor protection mechanisms, insolvency court powers, etc.). A number of market participants has expressed concerns that the Commission's proposal may create incentives for debtors to initiate inefficient and apparently unsuccessful restructurings and that the proposed framework law would shift too much power from insolvency courts, insolvency administrators and creditors to 'ruthless' debtors and their advisers. Insolvency proceedings in Germany are initiated by a formal filing to the competent insolvency court. Under German law, the debtor and each of his or her creditors are entitled to file for insolvency by asserting that the debtor is illiquid or over-indebted. An insolvency in Germany is always governed by the provisions contained in the German Insolvency Code and commencement of the proceedings is identical, irrespective of whether the parties involved seek a restructuring of the business or intend to have the assets liquidated and the sales proceeds distributed among the creditors. It is important for all stakeholders to understand that directors of German companies are under a statutory obligation to file for insolvency without undue delay, but in no event later than after the expiry of three weeks, if the company is illiquid or over-indebted. The three-week period is only applicable if there are restructuring efforts under way that may be expected to be successful. Otherwise insolvency has to be filed immediately. These statutory duties may create considerable time pressure during negotiations over a consensual restructuring. Failure to file for insolvency in due time is a criminal offence and may result in personal liability to the creditors of the company. Generally speaking, a company is illiquid4 if it is unable to meet its payment obligations as they become due. If the company actually ceases to make payments, illiquidity is presumed. Under certain circumstances, a company which is unable to discharge its due obligations out of available cash might still be considered liquid if it can be expected to be able to discharge its debt during the next three-week period. The German Federal Court of Justice tolerates a temporary funding gap of 10 per cent. Accordingly, a company must be able to pay at least 90 per cent of its obligations when they fall due if it is not to be considered illiquid. However, this only applies if it is not already evident that the funding gap will be greater than 10 per cent in the near future (i.e., within the next 3 weeks). Moreover, a 10 per cent funding gap is not tolerated in the long term. The Federal Court of Justice also allows funding gaps of more than 10 per cent if these can be closed or reduced to less than 10 per cent again within three weeks. Even if a company can only pay less than 90 per cent of its due obligations, it is not illiquid if it can meet at least 90 per cent of its due obligations at least within the next three weeks. Such a situation is known as a 'temporary stagnations of payments'. Two concepts are relevant in this regard. In principle, an insolvency filing obligation arises if the assets of the company (calculated on the basis of liquidation values and including hidden reserves) do not exceed its liabilities (including liquidation cost). Even in case the company is technically over-indebted, there is no obligation to file for insolvency if the company has a positive continuation prognosis. Pursuant to a widely held view in legal literature, this criterion requires that the liquidity of the company is sufficient to ensure survival for the current and the next financial year. This means that, effectively, the company is legally not considered over-indebted when continuation of the business, based on a reasonable and careful assessment, is more likely than not, regardless of whether technical over-indebtedness exists, (i.e., the liabilities exceed the assets). The assessment as to whether the continuation of the business is more likely than not, must be based on: (1) a realistic business plan; (2) a corresponding and realistic cash-planning corresponding to such business plan; and, resulting therefrom; and (3) an analysis that the business plan and the cash planning provide sufficient confidence that the company will be able to continue operations for at least the current and the next business year. Usually, a positive going concern prognosis is confirmed by an expert opinion in accordance with the IDW S 6 standard issued by the German Institute of Auditors. If challenged, the director of the company bears the burden of proof. The statutory duties in fact require directors to take all necessary steps to put themselves in the position to timely recognise the occurrence of any insolvency trigger. German insolvency proceedings can be split into two phases, first the preliminary insolvency proceedings and second the main insolvency proceedings. Preliminary insolvency proceedings serve the purpose of assessing whether main proceedings will be opened while at the same time preventing detrimental changes in the insolvency estate. To protect the estate of the insolvent company, the insolvency court will most likely immediately appoint a preliminary insolvency administrator. The main tasks of a preliminary insolvency administrator are to (1) secure and preserve the debtor's estate; (2) continue the business operations until the insolvency court decides on the opening of main insolvency proceedings; and (3) verify if the insolvency estate covers the costs of the proceedings. The duration of insolvency proceedings depends on individual factors, such as the size of the relevant insolvency estate, the number of creditors, the complexity of the envisaged restructuring and the number of employees. In practice, preliminary proceedings often last for approximately three months: under certain conditions, the Federal Labour Office bears Insolvenzausfallgeld, that is, salaries of the debtor's employees for the three months preceding the opening of main insolvency proceedings. The payment of Insolvenzausfallgeld is a significant incentive for (preliminary) insolvency administrators to keep preliminary insolvency proceedings open for the period of three months as this means a massive positive cash effect for the insolvency estate. In fact, the subsidy can be key for the continuation of the debtor's business in insolvency. It is established practice in Germany that banks pre-finance the Insolvenzausfallgeld to ensure that the debtor's employees are paid regularly in the preliminary insolvency stage. The German Insolvency Act does not explicitly provide for a moratorium as part of the preliminary proceeding. However, the insolvency court can order a variety of 'provisional measures'. These measures can be ordered jointly with the court's opening decision or separately at a later stage. In particular, the insolvency court may order that assets that would be subject to a right of segregation or for which separate satisfaction may not be used or collected by the creditors and that the assets may be used to continue the enterprise insofar as they are of considerable significance for the insolvency estate. The insolvency court can also order that claims cannot be enforced against the debtor. These measures aim to keep the insolvency estate together to enable the insolvency administrator to pursue a structured sale of the business as a going concern or implement other restructuring measures. If at any time during preliminary insolvency the preliminary insolvency administrator concludes that the company is in fact not insolvent or that the insolvency estate does not cover the costs of the proceedings, the insolvency court will terminate insolvency proceedings. In this case, creditors regain the ability to enforce claims individually. Main insolvency proceedings serve the purpose of winding down the insolvency estate by disposing of the debtor's assets (including a disposal of the entire business or parts thereof as a going concern) and distributing the proceeds to the creditors in accordance with the applicable priority provisions, or restructuring the company in accordance with an insolvency plan to be approved by the creditors by majority vote in groups (see Section II.ii at Insolvency plan proceedings). Once insolvency proceedings are opened, the insolvency court will appoint a regular (non-preliminary) insolvency administrator. Upon opening of main insolvency proceedings, the power to dispose of and administer the insolvency estate shifts to the insolvency administrator. The insolvency administrator is under an obligation to act in the best interests of the creditors. He or she is not responsible towards the shareholders of the insolvent company and will attempt to dispose of or restructure the debtor's business with a view to maximise the distributable proceeds. While the enforcement of security rights by individual creditors in the preliminary stage depends on whether the insolvency court has ordered interim measures in favour of the debtor, no individual enforcement of the rights of unsecured creditors is possible once main proceedings are opened and the realisation of security is widely restricted (e.g., the right to realise assets that are subject to a right of segregation vests with the insolvency administrator who distributes the sales proceeds to the secured creditor after deduction of a service fee). The insolvency administrator will, as part of his or her standard exercise, also check whether security rights can be contested and are thus voidable. In particular, security that was granted within the three months before the opening of insolvency proceedings bears a significant risk of being contested once main proceedings are opened. In large-scale insolvencies, a (preliminary) insolvency administrator will usually: (1) first seek contact with the debtor's main stakeholders (including creditors, unions and shareholders, if any anchor shareholder is identifiable); and (2) initiate a structured sales process to give as may bidders as possible the opportunity to scrutinise the business and submit offers for the whole business or parts thereof. This process will in most cases already have been initiated in the stage of preliminary insolvency proceedings. Often a deal is already negotiated at the time main proceedings are opened or even signed subject to the conditions that: (1) the proceedings are opened; (2) the creditor's committee or the creditor assembly, as the case may be, approves the deal; and (3) the preliminary insolvency administrator is appointed as insolvency administrator. If the debtor's management has already been in (advanced) negotiations with a bidder prior to insolvency, the administrator will often be inclined to treat such bidder as preferred partner. However, a structured M&A process will comfort the insolvency administrator's position as the outcome will demonstrate that he or she ultimately entered into a reasonable deal. In insolvency, the insolvency estate is factually 'owned' by the creditors. Correspondingly, insolvency proceedings are mainly controlled by creditors rather than by the management or the shareholders. The creditors assert influence via the creditors' assembly and the (preliminary) creditors' committee. The institution of a preliminary creditors' committee is mandatory if the debtor fulfils certain criteria in relation to his balance sheet total, gross turnover and number of employees. The insolvency court is responsible for appointing the members and instituting the committee. In a reasonably prepared insolvency, the debtor will already have reached an agreement with the main stakeholders that they will send representatives into the preliminary creditors' committee. The court will then be in a position to institute the committee at the very beginning of the proceedings. The (final) creditors' committee shall consist of representatives of: (1) the secured creditors; (2) the insolvency creditors with the highest claims; (3) creditors with small claims; and (4) the employees. The composition rules are also practised for the preliminary committee. A 'typical' result of the institution process would thus be a committee with five or seven members, representing banks, the employees, the pension protection fund, smaller (trade) creditors, factoring companies and commercial credit insurance providers. Shareholders of the insolvent company cannot be members of the (preliminary) creditors' committee. The preliminary creditors' most important power is its ability to influence the selection of the (preliminary) insolvency administrator. A unanimous vote of the committee in favour of a candidate overrules a deviating court decision, provided the person elected by the committee is eligible, independent and neutral. After main proceedings are opened and prior to the first creditors' assembly, the insolvency court may institute a creditors' committee. The members of the creditors' committee are then elected by the creditors' assembly. The committee's main task is to assist and to supervise the insolvency administrator. Certain fundamental decisions, such as the disposal of the business (or parts of it) require the prior consent of the creditors' committee and the committee is involved in all material decisions relating to the insolvency proceedings. The main creditor representative body of German insolvency proceedings is the creditor's assembly that can set up the creditors' committee or revoke any court-appointed creditors' committee. Core decisions regarding the insolvency proceedings, such as the decision whether to liquidate the insolvency estate or to temporarily continue the business operations of the insolvent company, are taken by the creditors' assembly. If no creditors' committee is appointed, certain fundamental decisions require the prior consent of the creditors' assembly. The sale of the business operations to a shareholder of the insolvent company requires the prior approval of the creditors' assembly in any event. Decisions of the creditors' assembly are taken by simple majority according to outstanding amounts. Subordinated creditors and creditors entitled to segregation do not have any voting rights in the creditors' assembly. Large corporates have in recent years often filed for insolvency in the form of 'self-administration'. If the management applies for the initiation of self-administration and the insolvency court follows that route, the court will order that the management of the debtor stays in charge of the operations to the effect that the restructuring or the liquidation of the debtor is not implemented by an insolvency administrator but by the management itself. Self-administration may only be ordered if it is not expected that self-administration could work to the detriment of the creditors. Self-administration is often considered to be an effective tool in a situation where insolvency is not a result of the failure of the current management but rather because of external circumstances or failure of the previous management. In this situation, it is often preferable to make use of management's skills and company-related expertise and to have management implement a restructuring (or liquidation via asset deal) rather than bringing in an insolvency administrator who would have to start from scratch. The management in self-administration will be supervised by a court-appointed (preliminary) custodian who needs to approve material transactions and reports to the insolvency court. Self-administration requires a skilled management, and the initial filing requires thorough preparation. Often, an insolvency in self-administration is being prepared as a plan B to back up negotiations with creditors on a consensual restructuring of debt. Thereby the management preserves its options, should out of court negotiations fail. These processes are often steered by a CRO who was hired specifically for that purpose. Self-administration can – and very often is – combined with insolvency plan proceedings, in which case management would not only prepare and develop the insolvency plan but also implement the plan once approved by the creditors. Insolvency plan proceedings are an instrument to restructure or liquidate (e.g., via asset deal) the insolvent company while derogating from the rules for the regular insolvency proceedings. The preparation of an insolvency plan may be initiated by the debtor's management, by the insolvency administrator or by the creditors' committee. Insolvency plans are, at least in large-scale insolvencies tailored individually. The underlying concept is that creditors are often better off if the insolvent company is continued. In addition, the insolvency plan procedure allows the implementation of corporate measures that could not be used otherwise. A restructuring and sale of the businesses via insolvency plan may be particularly favourable if the value of the insolvent company consists of non-transferable intangible (IP) rights, concessions, licences, patents, favourable contracts5 or other assets that are not transferable in the course of an asset deal transaction without third-party consent. Other aspects that call for a restructuring of the debtor may be an intact stock exchange listing, the debtor's position as group parent with non-insolvent subsidiaries and a specific tax position. Often, insolvency plans are used to restructure the insolvent legal entity (in contrast to a liquidation of its assets and a subsequent winding down of the entity) including by implementing haircuts, operational restructurings such as the termination of unfavourable contracts or a reduction of the personnel under insolvency rules. The restructured entity can then be sold and transferred to an investor who, as consideration, injects fresh money into the entity and pays a purchase price into the insolvency estate. The transfer will then be an integral part of the insolvency plan and will become effective upon court confirmation. The German Insolvency Code allows the inclusion of shareholders into the plan and explicitly provides that: (1) the constructive part of the plan may set forth that creditors' claims may be converted into share rights or membership rights in the debtor with the creditor's consent (debt-to-equity swap); and (2) the plan may foresee a decrease or increase in capital, the provision of contributions in kind, the ruling out of subscription rights, or the payment of compensation to outgoing shareholders. In essence, an insolvency plan may set out any rule permissible under corporate law (Section 225a Paragraph 3 German Insolvency Code).6 Procedural requirements and approvals that would apply under relevant corporate law for the implementation of any such corporate measure are suspended and substituted by the rules on voting and adoption of the insolvency plan. This involves that corporate law minority rights are widely suspended. Dissenting shareholders have little to no option to challenge a restructuring via insolvency plan other than by means of the limited remedies provided in the German Insolvency Code. However, an insolvency plan can also provide that the debtor is liquidated by selling off profitable business units as a whole by means of one or more asset deals, while winding down non-profitable businesses by terminating unfavourable contracts with customers or suppliers, or both, and reducing staff. Finally, an insolvency plan may also be used to modify the proceedings as such without containing any substantive provisions or regulating the winding down. An insolvency plan needs to be adopted with a majority vote of the creditors. An insolvency plan is voted on within creditor groups as provided for in the insolvency plan and within the statutory rules governing the composition of such groups. An insolvency plan is accepted if: (1) within each group a simple majority of the voting creditors – in number and according to outstanding amounts – consents; and (2) all groups consent. To prevent obstructive behaviour of individual creditors, the consent of a group of creditors is, simplified, deemed to have been granted if: (1) the members of the respective voting group are not worse off under the insolvency plan compared to the prospective outcome of regular insolvency proceedings; and (2) the majority of groups has consented the plan (cramdown). Minority creditors are protected since creditors that have been overruled need to be better off under the insolvency plan than in regular proceedings. In 2012, the German legislator introduced a modified preliminary self-administration proceeding by implementing the Schutzschirmverfahren. It neither constitutes an own type of insolvency proceeding nor a mechanism to restructure a company outside of insolvency proceedings (no pre-insolvency restructuring mechanism). Instead, protective shield proceedings are designed to buy a debtor that is not cash-illiquid time in order to prepare an insolvency plan under self-administration without running the risk of being liable for delaying insolvency. The protective shield mechanism has been used increasingly to prepare pre-packed deals by means of an insolvency plan while avoiding liability risks on the part of the managing directors. In parallel to the application for self-administration, the company can apply for protective shield proceedings, upon which the insolvency court grants, under certain conditions, a 'protection period' of up to three months during which management can prepare an insolvency plan. During protective shield proceedings, there is a ban on individual enforcement. Main proceedings are being opened at the earlier of the lapse of the protection period and the time on which the debtors hand the insolvency plan to the insolvency court. Clawback rights are subject to constant debate in Germany, with numerous disputed aspects and sometimes incoherent high court decisions. Despite recent reforms to cut back perceived excess clawback rights, the clawback regime still produces harsh results and is not always intuitive from a creditor's perspective. Restructuring activities are not per se privileged in Germany, and fees paid for advisory services with respect to a failed restructuring may, therefore, be subject to clawback. In practice, insolvency administrators often raise clawback claims to open a forum for discussions on a settlement. In the end, those confronted with potential clawback claims will often agree to make settlement payments to avoid lengthy court disputes with an uncertain outcome. Under German law, both legal and factual transactions can be challenged. The term 'transaction' encompasses all actions causing legal effects that may decrease the value of the debtor's assets to the detriment of insolvency creditors. A detrimental effect is determined objectively and requires that the relevant transaction has prevented, endangered, hampered, impeded or delayed the satisfaction of insolvency creditors as a whole. Detrimental effects are caused by a curtailment of the debtor's assets as well as by an increase of its liabilities. According to the prevailing view in German legal literature, even a sale of assets for a fair market value consideration can be deemed to be detrimental to the creditors of the debtor if the proceeds are no longer available at the time of insolvency (indirect detriment). The entering into, amendment, cancellation or assignment of contracts or contractual obligations as well as the detrimental effects of asset transfers and other in rem transactions are the most typical transactions to be challenged under German law. Upon successful enforcement of a clawback claim, the other party is obliged to return the assets to the insolvency estate or, if such return is not possible, compensate the insolvency estate in cash. Detrimental transactions by a debtor with a third party are voidable if made during the three months prior to the filing for opening insolvency proceedings and at a time when the debtor had been illiquid (i.e., unable to pay its debt) while such third party was aware thereof. Knowledge of the financial stress situation by the third party is likely to be assumed following, for example, due diligence exercises, communication during negotiations or other inside information obtained in business relations. Detrimental transactions implemented up to 10 years prior to the filing for insolvency may be challenged if the debtor acted with the intent to harm other creditors and the other party was aware thereof. The standard of intent is rather low under applicable case law and is in particular presumed if the purchaser had knowledge that seller's illiquidity was more likely than not (>50 per cent) within the current or the subsequent financial year (referred to as 'imminent illiquidity'). Generally, courts readily assume intentional actions by both the debtor and the respective third party, in particular if the third party is aware of a financial distress situation. As a rule of thumb, a debtor is deemed to have acted with the intent to harm other creditors if it is generally aware that the transaction at hand is to the detriment of other creditors (because it cannot reasonably trust that all current and future creditors will be satisfied) and continues to act despite this awareness. A debtor acts with the intent to harm other creditors if it is illiquid at the time of the transaction. In addition, courts have developed a number of prima facie evidence norms that have indicative significance in a court procedure. However, in 2017 the German legislator tightened the requirements under which transactions can be avoided by the insolvency administrator: where the transfer of an assets or granting of collateral was legally owed by the insolvent party (e.g., under contract), an intent to harm the creditors will only be presumed by the courts if the other party had knowledge that at the time when the transaction was implemented the debtor was actually illiquid (rather than only imminently illiquid) and in such cases the relevant clawback period will only be four years (rather than 10 years). In the German restructuring practice a number of informal (i.e., not court-governed) tools and strategies can be observed, particularly in large-scale and cross-border cases, which often require innovative approaches to overcome the deficiencies of statutory laws. Parties are in principle free to negotiate amendments of loan agreements and other legal relationships at any time. Such settlements have legal effect only between the parties. From a debtor's perspective the main difficulty in initiating consensual restructuring discussions is that creditors are not obliged to contribute and neither are they prevented from enforcing their rights. In particular, small or secured creditors often have little incentive to agree on compromises. In order to be successful, a debtor will have to persuade main creditors to enter into a moratorium or stay agreement at an early stage of discussions. All parties involved may have to accept that hold-out creditors will ultimately be satisfied in full while others accept haircuts or make other concessions. Restructurings in particular in the SME segment are sometimes implemented or governed by share trust structures, whereby creditors aim to shift control over the shares in the debtor from the previous owner to a professional trustee and a new management. Trustee and interim management will, subject to several conditions, exercise the shareholder rights and perform duties on behalf of the former legal owner and, at the same time, on behalf of the creditors. The underlying trust agreements usually define conditions under which the trustee is entitled or obliged, or both, to initiate a structured sales process for the company or specific businesses. The terms of bonds that are subject to German law and for which the German Bond Act 2009 applies can be restructured by majority vote of the creditors, provided that the bond terms explicitly foresee the possibility for such modifications. In addition, the bondholders must approve material amendments in a bondholder meeting with 75 per cent of the votes cast. Today, most bonds issued under German law contain a clause that enables amendments of the terms by creditor majority resolution. It is also market-standard to appoint a common representative to streamline communication with the anonymous mass of bondholders in a situation of distress. In April 2017, the German legislator introduced amendments to the German Insolvency Code to limit clawback rights. The aim of the reform was to increase the predictability of clawback risks for (SME) companies doing business with financially distressed counterparts. In addition to the reduction of the clawback period from 10 years to four years in case of congruent coverage (see Section II.ii at Clawback risks), the amendments provided for a better protection of payments following a customary deferral of payment granted along the chain of suppliers and employee's claims. The interpretation of clawback rules remains controversial, and it is doubtful whether the 2017 reform meant substantial progress for SMEs confronted with a distressed supplier or customer. On 21 April 2018, the German Law for the Facilitation of Group Insolvencies came into force. New provisions were introduced to the German Insolvency Code, aiming to address procedural challenges that emerge under German insolvency law in relation to an insolvency of a German company that belongs to a group. In line with the approach taken on a European level for cross-border insolvency cases (Article 56 et seq. of EU Regulation 2015/848 on Insolvency Proceedings, which came into force on 26 June 2017), the fact that the insolvent company is part of a group does not open the gate to combined insolvency proceedings. Each company remains obliged to file for insolvency separately, and proceedings are strictly independent. However, the new provisions introduced rules governing the communication and coordination of and between insolvency administrators and insolvency courts. The law now specifically appreciates that the same person can be appointed as insolvency administrator for more than one group company and recognises the option to determine a comprehensive group venue, and in case of conflicting interest between group companies the appointment of an additional administrator to solve such situations. Consequently, the German Insolvency Code allows that a 'group insolvency court' steers group coordination proceedings and appoints an additional group coordinator (if required in case there is not one administrator for all entities) whose task is to develop a comprehensive group coordination plan. Creditor committees and insolvency courts are legally obliged to coordinate and exchange information. Despite the overall decrease in the number of insolvencies, 2017 and early 2018 produced a number of large-scale insolvencies and prominent out-of-court restructuring activities. The case gaining most media and restructuring expert attention was clearly the insolvency of Germany-based airline Air Berlin. Following a preliminary self-administration, the businesses of Air Berlin were ultimately sold in pieces by Air Berlin's German insolvency administrator and, as regards Air Berlin's subsidiary NIKI, an Austrian insolvency receiver, in each case to competitors from the aviation industry. The Air Berlin insolvency was remarkable not only owing to its size and general importance for the functioning of the European transportation sector but also because the NIKI insolvency marked a prominent test for the interpretation of Article 3 EU Regulation 2015/848 on Insolvency Proceedings (definition of COMI in a group context). Other industries affected in 2017 include the automotive industry (REGE), the renewable energy and shipping sector (Solarworld AG, Rickmers Holding), the German fashion and retail industry (Matratzen Direct, Gebr Sanders, Butlers) and a well known kitchen manufacturer (Alno). In particular the automotive supply industry is expected to change rapidly with potentially required financial and operative restructurings as suppliers face serious challenges with the of the power train to hybrid or electric drive units and questions of ownership and control over data will become crucial for suppliers' systemic importance in the supply chain. In April 2018, Munich-based container financing company P&R filed for insolvency. Some say this case marks one of the biggest financial scandals in modern German history. Previous insolvencies in the private investment sector from previous years are Infinus, Prokon and S&K. Some experts argue with reference to P&R and other prominent cases that German law does not yet adequately shield investors in the 'grey' capital markets for private investment. P&R sold shipping containers to private investors, rented them back and offered to repurchase them after an agreed term for a predefined amount. P&R was thus relying on its ability to generate more cash with its own rental activities to international leasing companies than it was committed to pay to its investors. Apparently, the business model failed in recent years and it is yet unclear whether P&R has in fact turned into a Ponzi scheme. According to preliminary statements published by the administrator, P&R had sold approximately 1.6 million containers and drew €3.5 billion in business from approximately 54,000 investors – but had only 600,000 containers when P&R went into insolvency. increased insolvency protection of customers in property development projects. However, the next big thing to hit the German insolvency framework will be the result of the insolvency-related European Commission initiative, assuming that the legislative process on the implementation of a framework law for preventive restructuring proceedings (COM (2016) 723) will be continued. The implementation of the European Commission proposal (or a comparable preventive restructuring proceeding) may force the German legislator to revise several domestic insolvency law concepts and rethink fundamental creditor protection instruments (see Section I). 1 Torsten Göcke is a senior associate at Hengeler Mueller Partnerschaft von Rechtsanwälten mbB. 2 Data derived from the European Central Bank website, available via www.ecb.europa.eu. 3 Data derived from the German Federal Statistical Office website, available via www.destatis.de. 4 German insolvency law recognises an additional reason for the director to file for insolvency: drohende Zahlungsunfähigkeit, imminent illiquidity. However, imminent illiquidity is not a mandatory reason for the director to initiate insolvency proceedings and practical importance is low. 5 Change of control clauses do not apply if contracts are transferred under a plan. 6 The structuring of reorganisations via insolvency plan is complex and requires corporate, insolvency and tax expertise, in particular since DES/haircuts generally create taxable restructuring gains on part of the debtor that may qualify as Masseverbindlichkeiten (mass debt) and which may impede the entire restructuring.